In the book "Five People You Meet in Heaven," author Mitch Albom describes each person's heaven as their favorite place on earth. (This book is a wonderful and quick read, and will quickly make you realize how important each of are to the tapestry of life.) If this is true, I know my heaven will be our little lake community in Pine Lake Park. Our bungalow is truly modest - 2 bedrooms, a bath and a galley kitchen that comprise less than the square footage of the first floor of our house in New Jersey -- but it has all I need. Our small lake is, to me, water of well-being, peace and healing. Each day as I swim in it, I feel baptized and blessed. The sound of the bull frogs and crickets each night are the lullaby of the universe. I am so lucky to be here! I have basically moved up here for the summer -- and it is so conducive to painting, meditating, contemplating, and stillness. 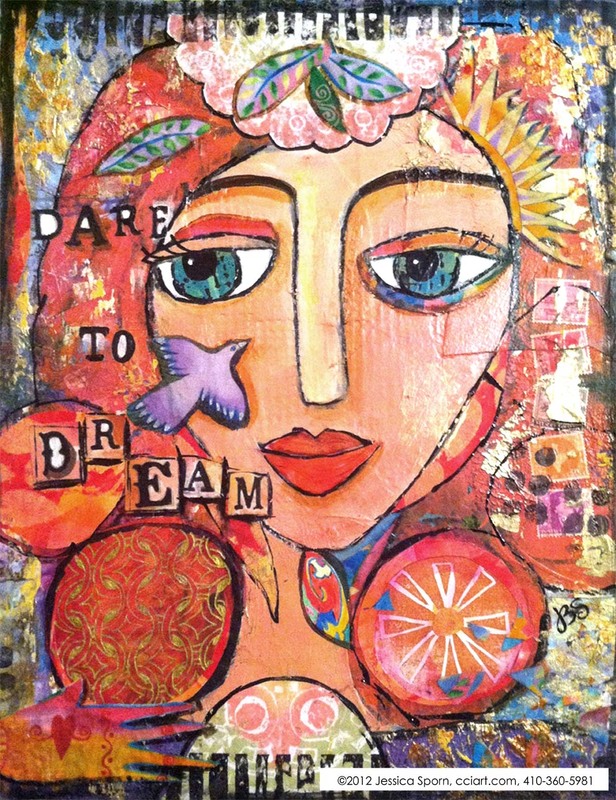 Here is a piece I just finished, called "Dare to Dream." Scrapping the Music's prompt this time around was the song "Somewhere Over the Rainbow," which is near and dear to my heart. I chose the lyric "dare to dream," from the phrase "and the dreams that you dare to dream really do come true." This canvas includes pieces of fabric I designed for Robert Kaufman, collage and stamped paper I made at CREATE, and the zentangle Mi-Mi 80 from the Diva's 80th challenge. For years I've dreamed about spending the entire summer at Pine Lake -- and here I am! Yeah Jessica!!! Dream on!!!! I absolutely love your art journal page! Thank you do much for joining in on the fun this week! Your style is fantastic, fun, modern, and you incorporate the zentangle is just the right way! I'm new to your blog, introduced through Marcia Beckett's Dabblings. I'm very much enjoying your work and your commentary. Like you, I have a heavenly place for the summer, called Lubec, ME. Here's to making dreams come true. Jessica, beautiful. 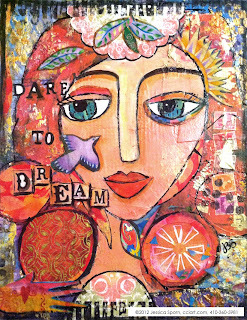 The words blend beautifully well with the painting 'dare to dream'. Great journal page. I really like your Mi2 in gold on the red background. Congrats on getting to spend the summer at the lake! I can tell it clearly agrees with you just by looking at this fabulous collage! I love all the color you have but you still have such a strong focal point! hello, Jessica! i love the vibrant colors in your paintings and the inspiring words. your lake sounds lovely! i enjoyed getting to know the famous Jessica Sporn in paint party friday! hugs! ooh - I hope you feel better soon! Beautiful piece Jessica, and you write so well too! Lovely words and art to match! Hi Jessica. Just read your PPF feature--love your work. Also you and I went to the same high school and I also studied drama. Small world, eh? awesome creation--thanks for the poem by LH too, I hadn't heard it for a long time and it was always one of my favorites growing up. I just finished Mitch Albom's "Have a Little Faith" and really enjoyed it, and haven't read "5 People" yet, but will add it to my list. Came to visit from STM. Amazing, Jessica! You are so talented. Thank you for sharing your work. Sounds just wonderful to be where you are now. I felt relaxed reading this! I think you should stay by your lake if it inspires lovely things like "Dare to Dream"! What a beautiful piece! Your summer lake retreat sounds wonderful. Nature has such a magical way of soothing and bringing things into perspective doesn't it? I'm happy to have found your blog through Artists In Blogland, and look forward to seeing more of your creations! Love love love this piece! This IS enchanting. I love it. Very creative and colorful, love ur work, voted on AIB july. wishes!! !